There is always an uneasy balance between trying something new and just refining what has come before. Try something that’s too different from what has come before or bring too many small innovations and you might find yourself with no one interested by your game. Keep it too close to what has come before and the same will happen. After all, why would I play your game instead of what I already have/know? So it’s always tricky to innovate, be it mechanics or theme. By creating a line of games that are in a new, shared universe which is not an already existing IP, Alderac Entertainment Group, or AEG, does just that. The Tempest universe is a new one, which while it might feel a little like some of the more familiar fantasy/old timey universes, nonetheless brings something new to the table. And by having each game be a new chapter of an evolving storyline, they bring a novel concept to boardgames. Most gamers will be familiar with the second game of the series, Love Letter, but less so with the game that opens up the storyline, Courtier. 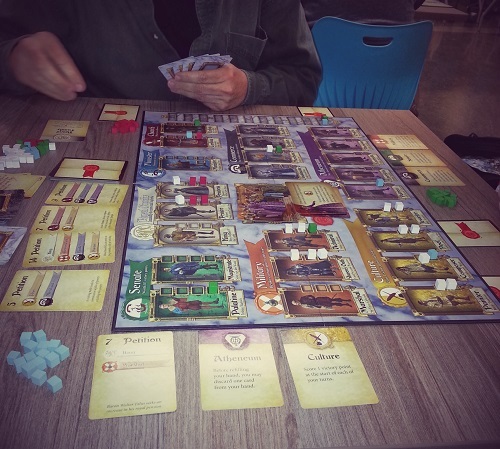 The idea of having boardgames being connected together by a storyline is new, but what of Courtier itself? Does it bring something new to the table and if it does, is it interesting? 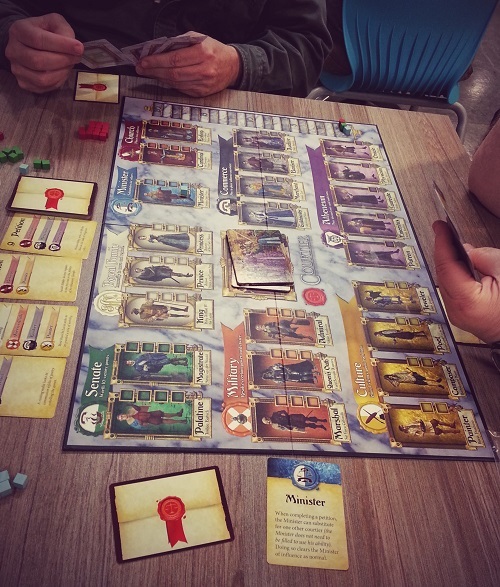 Courtier (Alderac Entertainment Group) by Philip duBarry, is an area majority game for 2 to 4 players, where the players in turn will use a hand of cards to place or replace Influence cubes on a Courtier, trying to gain their favor. Having a the most influence over the correct Courtiers allows you to fulfill Petitions, which in turn will lead to new Fashions from the Queen, until she is arrested for crimes of treason against the state (or put another way, the End of Game card is draw). Why did the Queen get arrested? Find out in the next chapter. Each Courtier is also a member of a Coterie, the control of which can grant the player a number of different abilities. Controlling a Coterie doesn’t mean that a player control the most Courtier, but rather that he simply has more influence than anyone else. AEG did a really nice job with this game. The gameboard is nicely illustrated with every elements clearly identified. The many decks of cards (Influence, Power, Fashion, Petition, Coterie Abilities) have nice, bright artwork and are easy to read even across the table. The rulebook is quite good, and is well organized, making it easy to look up rules questions during the game, although this didn’t happen very often during the game. For some reason, I really like the Influence cubes. Between the nice matte finish and the slightly less bright colors, these are some of the nicest cubes I’ve played with. I know it’s a small thing, but they actually made the game feel somewhat luxurious. One aspect I like about the game is that since it is part of the Tempest universe, it does share an art style (and artists) with the rest of the series, which only re-enforces the shared universe feel. All in all, a nice package. Setting up the game is as simple as putting the game board which represents the court, all of the Coteries and Courtiers that make up the Coteries, in the middle of the table. Then shuffle the Petition cards, deal one to each player which they will keep secret, and deal one additional card per player, face up beside the board, which will be the open Petitions. Set the neutral Influence cubes to the side and give each player 15 Influence cubes of his color, put one of the remainder on the victory point track and setting the rest with the neutral cubes. Take the Fashion cards and remove “The Queen is arrested!” card, since this is the card that indicates the end of the game. Shuffle the rest and deal out two piles of 6 cards. The rest of the Fashion cards are put back in the box without looking at them. Shuffle the end card (Queen is arrested) in one of the two piles, placing the other one on top (the end of game card should be in the bottom six cards). Shuffle both Influence and Power cards decks. The first player now decides what the composition of the first hand is: he can split 5 cards between Power and Influence cards however he sees fit, but he must call out the number of each before seeing what they are. Once he has decided, the cards are taken and placed face up on the game board. Each other player does the same in turn until there are one dealt hand per player in the middle of the board. The game starts with an auction round, with each player bidding Influence cubes on one of the hands of cards, going around until each player has a bid on a single hand. A player can only bid on a single hand, taking back his Influence cubes should he be outbid by someone else. Once bidding is concluded, all players take the hand they won, placing the cubes used for the winning bid with the neutral cubes. The top card from each deck is then placed face up beside the decks. Once he has taken his action, the player can complete a Petition if he can. He can only complete one Petition per turn. The player then draws either a Power or an Influence card (player’s choice) from either of the face up cards or from the top of their respective decks. If the player chooses a face up card, he must pay 1 Influence cube for the privilege and then replaces it. 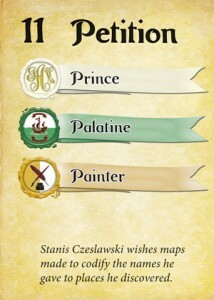 Influence cards are fairly straightforward: they allow the player to place a single Influence cube on a Courtier. They come in three general flavor: some state a specific Courtier, some a specific Coterie and the last allows for any Courtier. As a rule of thumb, an Influence cube has to be placed in an empty spot first, and only if there are no empty space can the player replace someone else’s (or a neutral) cube with their own. Power cards are a little more, well, powerful, allowing the players to more directly influence the board by moving or replacing Influence cubes, replace a given Courtier in a Petition or manipulate the player’s hand of cards or the decks in some way. They can be quite nasty when used at the right time. Influence cubes are used to judge two separate types of majority: control over a Courtier or control over a Coterie. 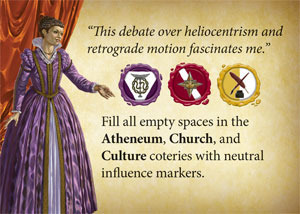 Both levels of controls are slightly different: in order to get control over a Courtier, all spaces belonging to it must be filled with either player’s Influence or neutral Influence. The player who has the most Influence cubes controls that Courtier and can use him/her to fulfill a Petition. Note that if a Courtier is completely filled with neutral cubes, the active player is considered to be controlling him or her, which will happen often after a Fashion card has been revealed. To control a Coterie (a group of Courtier), all you need is more Influence cubes in that Coterie than anyone else. You can control a Coterie without controlling any Courtier in the group. Having control of a Coterie grants you the Coterie’s power, which ranges from doubling the use of specific Power cards, getting 1 VP each turn, gaining 10 VP at the end of the game, placing two Influence cubes instead of 1, etc. While the powers of the Coterie aren’t game changers, they can nonetheless greatly help the player towards victory. To complete a Petition, whether a secret or an open one, the player simply has to control all of the Courtier that are listed on the card. He then shows his opponents, takes the cubes off of all Courtiers that are used, returns them to their respective owner, with neutral Influence going back to the pool. The player will score the VPs indicated on the card at the end of the game. 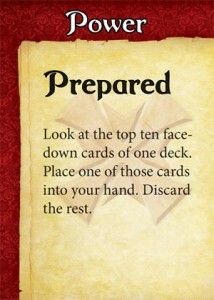 The top card of the Fashion deck is then flipped and the instructions are followed. 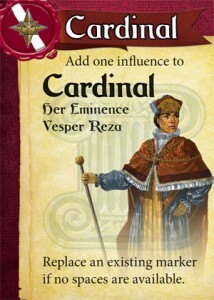 In the majority of cases, it will instruct the players to fill the empty spaces of some Courtier, either from specific Coteries, or Coteries that have Influence from players. Some of the Fashion cards will also tell them players to take one or several Influence cubes from the pool. Should the Fashion card flipped over be “The Queen is arrested!”, the game ends immediately. The players tally the VPs from their fulfilled Petitions, add any VPs they might have on the VP track and any other bonus they might have gained. The player with the most VPs is the winner. After only one play, I’m very unsure how I feel about this game. As the game I played was a three-hander, the dynamics were a little odd, with lots of controls but a slow filling board. We didn’t see our first Petition being filled for about 5-6 turns and then, 3 in rapid succession, with a lull once more for 6-7 hands, and then, 2 in a row, and so forth. This weird rhythm, with sudden spikes in point scoring is tied closely to the Fashion cards and their filling of certain roles/family with neutral cubes, allowing the next player to quickly fill a Petition with neutral-filled Courtier. This create an artificial acceleration, but in a somewhat unpredictable fashion. Part of the problem is also exacerbated by the impression that it wasn’t because of clever play, but rather luck of the (Fashion) draw. You didn’t so much decide whether or not to fulfil an open Petition, but rather did it because it was claimable and you didn’t want someone else to grab it. This is made worse by the fact that while there will be a minimum of 6 Petition, there can only be a maximum of 12, which means that, on average, only 2 to 4 Petition are actually planned, the rest are just players taking advantage of the situation. Of course, this might have to do with the players not being familiar with the game and not knowing what to expect. Also, since we weren’t sure how the game would play out, we might have been less aggressive than the game warrants, but again, I’m not too sure how much this would change. At the end of the day, with only one card being played by a player per turn, it’s always a better bet to advance your own agenda than try to screw someone over. Of course, if you happen to have a card that can do both, more power to you. There is also the aspect of the Influence cubes and the common bank. I’m not sure why this is set up this way. In our game, no one ever got close to running out of cubes since we didn’t spread all that much over the board, but rather concentrated in placing our Influence on the Courtiers we needed. Maybe if the bidding had been more aggressive for the opening hand, things would have been different, but I can’t see bidding going above 3-4 Influence cubes, leaving players with at least 10 cubes each. Also, whole most of the Coterie powers looked useful, we mostly ended up concentrating on Culture (1 VP at the start of player’s turn, which I forgot a few times), the Minister (which allows it to substitute for any other Courtier when completing a Petition), Military (which allow for the doubling of any Power card that bears the Military logo) and the Church (allows the doubling of Influence cubes when using an Influence card). While the Senate (10 VP at the end of the game) and the Royal Family (other players cannot use Power cards to move your cubes except in the Royal Family Coterie) looked interesting, no one controlled them for long enough to get the full use of their power. I’m not quite ready to pull the plug and say this is a bad game. With the speed of play (the game we played lasted about 45 minutes, including explanation with very little downtime) and the level of decision making, I’ll need to put this on the table a few more time before I decide either way. Who knows, it might just be the light area-majority game that I’ve been looking for. This entry was posted in Session Report and tagged Coutier on October 28, 2013 by TopDog.